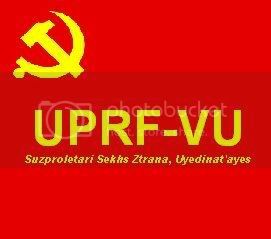 Forums / In game politics / Longe live the UPRF-VU! LONG LIVE THE United Peoples Revolutionary Front of Visual Utopia! WE CANNOT BE DESTROYED! The IMMORTAL words of Comrade Bormann STILL LIVE on today! Look, and marvel at the POWER of the UPRF-VU! The Empire of the Phantom, most powerful nation in the world of Valhalla, has been broken down, taken to its knees IN A MATTER OF SECONDS. Look at you, imperialist leaders! I have seen your governments. YOU have ALL claimed to have killed the great Klaus Bormann! Our cells had, at one time, infiltrated the Paladins, and Phoenix, both of which are now defunct! A MESSAGE TO ALL: IMPERIALISM'S DAYS ARE SOON TO COME TO AN END! NO IMPERIALIST NATION WILL BE ABLE TO EXPLOIT THE WORKING CLASS ANY LONGER. OUR BOMBS WILL BEAT YOUR GOVERNMENTS SHIELDS LIKE A DRUM. KOMUNIZMU TAHRIR AKBAR! LONG LIVE THE IMMORTAL THOUGHTS OF COMRADE CHAIRMAN KLAUS BORMANN! TAHRIR! TAHRIR! L'A Il al-Komuniz! Please do not trust this guy he betrayed our kingdom. who exactly is the target for us all to hit that caused this mass-kicking etc of Phantom-members?! aka...who betrayed the kd and abused the vice-function?! Ohnoes comunistich trolls and orcs! Dark Orion, what about the cell you had in our country, UNSC? "Mr. Massoud." The one that we figured out and killed when you kept begging for me to promote you. Yes, I looked at your history. Forgot to mention that one, eh? It will get u out of the life!!! Lol :-). Welcome to the real world Orion. Still going to start abydos next era? A looooooooot of people will join! :-p.
Dark Orion is clearly mentally challenged. We should give him a hand instead of being all vengeful on him.